Searching for Delivery of Food in Bus or Food Service in Bus? Now you can book your favorite food along with bus ticket booking and we will deliver at your seat in bus. "FoodInBus" - A value added option given by www.eTravelSmart.com in association with Creamcrow to its valued customers to make their travel easy. 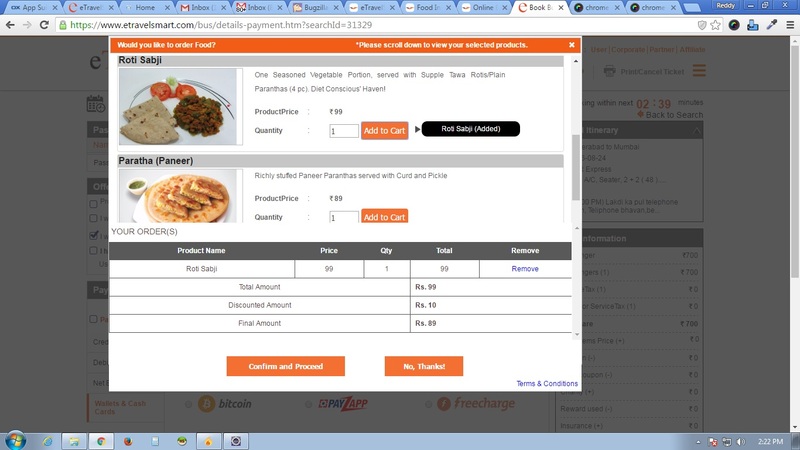 eTravelSmart has partnered with Creamcrowas reliable food ordering value added partner. 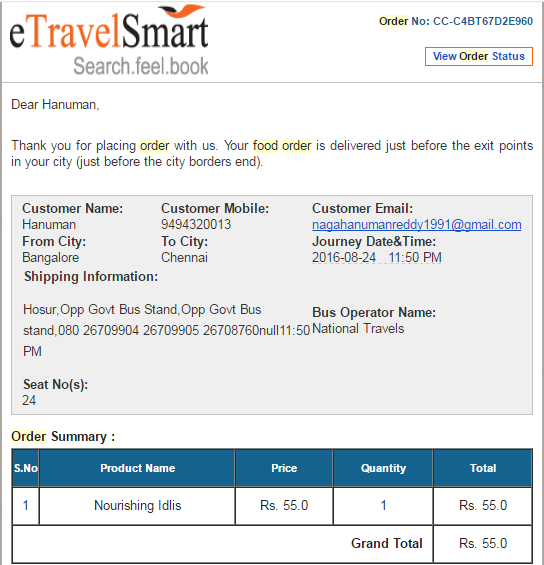 eTravelSmart bus customers can now order homely, hygienic food while traveling by bus. The food can be booked either through the eTravelSmart portal while booking a bus ticket, or independently from Creamcrow's website/app. Further, the food can be booked any time after booking a bus ticket from eTravelSmart up until 3 hours prior to the scheduled time of boarding. "Creamcrow" is an online and app based food ordering option for long distance (typically interstate) bus travelers. Lack of a reliable, homely and hygienic food option has always been a key pain point for inter-state bus travelers. While non-travelers have several options these days to order food online or through an app, a bus traveler completely lacks any such option. Further, the quality of food provided by road-side dhabas is far from ordinary.Creamcrow was founded with a vision to bridge this gap. How To avail the food order..? Select buses starting from Hyderabad to Mumbai, Pune, Shirdi. and Bengaluru to Chennai, Coimbatore, Thiruvananthapuram, etc. In check out page, click on the check box showing "I would like to order food" option . Select your preferred food item and click on Confirm and Proceed button. After Selecting food item to pay click on Book Now button . After successfully booking the food order you will receive the confirmation mail.